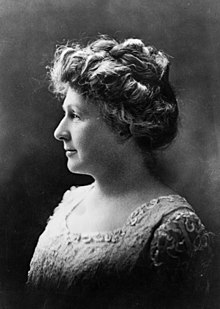 Annie Jump Cannon (/ˈkænən/; December 11, 1863 – April 13, 1941) was an American astronomer whose cataloging work was instrumental in the development of contemporary stellar classification. With Edward C. Pickering, she is credited with the creation of the Harvard Classification Scheme, which was the first serious attempt to organize and classify stars based on their temperatures and spectral types. She was nearly deaf throughout her career. She was a suffragist and a member of the National Women's Party. Annie Jump Cannon was born on December 11, 1863, in Dover, Delaware. She was the eldest of three daughters born to Wilson Cannon, a Delaware shipbuilder and state senator, and his second wife, Mary Jump. Cannon's mother was the first person to teach her the constellations and she encouraged her to follow her own interests, suggesting that she pursue studies in mathematics, chemistry, and biology at Wellesley College. Cannon and her mother used an old astronomy textbook to identify stars seen from their attic. Cannon's mother also taught her daughter household economics, which Cannon would later use to organize her research. Cannon took her mother's advice and pursued her love of astronomy. Cannon suffered hearing loss sometime during her childhood or early adult years. Sources vary on the time frame and actual cause, although it is sometimes attributed to scarlet fever. Some people claim Cannon's hearing loss made it difficult for her to socialize, resulting in her immersing herself in her work. She never married and did not have children. Soon afterward, Cannon was stricken with scarlet fever that rendered her nearly deaf. This hearing loss made it difficult for Cannon to socialize. As a result, she immersed herself in her work. In 1894, Cannon's mother died and life at home grew more difficult. She wrote to her former instructor at Wellesley, professor Sarah Frances Whiting, to see if there was a job opening. Whiting hired her as a junior physics teacher at the college. This opportunity allowed Cannon to take graduate courses at the college in physics and astronomy. Whiting also inspired Cannon to learn about spectroscopy. In 1896, Cannon became a member of "Pickering’s Women", a group of women hired by Harvard Observatory director Edward C. Pickering to complete the Henry Draper Catalogue, with the goal of mapping and defining every star in the sky to a photographic magnitude of about 9. In her notes, she referred to brightness as "Int" which was short for "intensity". Pickering said that she was able to classify stars quickly, "Miss Cannon is the only person in the world—man or woman—who can do this work so quickly." Not long after work began on the Draper Catalogue, a disagreement developed as to how to classify the stars. The analysis was first started by Nettie Farrar, who left a few months later to be married. This left the problem to the ideas of Henry Draper's niece Antonia Maury (who insisted on a complex classification system) and Williamina Fleming (who was overseeing the project for Pickering, and wanted a much more simple, straightforward approach). Cannon negotiated a compromise: she started by examining the bright southern hemisphere stars. To these stars, she applied a third system, a division of stars into the spectral classes O, B, A, F, G, K, M. Her scheme was based on the strength of the Balmer absorption lines. After absorption lines were understood in terms of stellar temperatures, her initial classification system was rearranged to avoid having to update star catalogs. Astronomy students are taught to use a mnemonic of "Oh Be a Fine Girl, Kiss Me" as a way to remember stellar classification. Cannon published her first catalog of stellar spectra in 1901. In 1911 she was made the Curator of Astronomical Photographs at Harvard. In 1914, she was admitted as an honorary member of the Royal Astronomical Society. In 1921, she became one of the first women to receive an honorary doctorate from a European university when she was awarded an honorary doctor's degree in math and astronomy from Groningen University. Cannon and the other women at the observatory were criticized at first for being "out of their place" and not being housewives. Women did not commonly rise beyond the level of assistant in this line of work at the time and many were paid only 25 cents an hour to work seven hours a day, six days a week. One of the other women in the observatory who made significant contributions, Henrietta Swan Leavitt, shared with Cannon the experience of also being deaf. Cannon dominated this field because of her "tidiness" and patience for the tedious work, and even helped the men in the observatory gain popularity. Cannon helped broker partnerships and exchanges of equipment between men in the international community and assumed an ambassador-like role outside of it. She wrote books and articles to increase astronomy's status, and in 1933, she represented professional women at the World's Fair in Chicago (Century of Progress). Cannon manually classified more stars in a lifetime than anyone else, with a total of around 350,000 stars. She discovered 300 variable stars, five novas, and one spectroscopic binary, creating a bibliography that included about 200,000 references. She discovered her first star in 1898, though she was not able to confirm it until 1905. When she first started cataloging the stars, she was able to classify 1,000 stars in three years, but by 1913, she was able to work on 200 stars an hour. Cannon could classify three stars a minute just by looking at their spectral patterns and, if using a magnifying glass, could classify stars down to the ninth magnitude, around 16 times fainter than the human eye can see. Her work was also highly accurate. On May 9, 1922, the International Astronomical Union passed the resolution to formally adopt Cannon's stellar classification system; with only minor changes, it is still being used for classification today. Also in 1922, Cannon spent six months in Arequipa, Peru, to photograph stars in the Southern hemisphere. In 1925 she became the first woman to receive an honorary doctorate of science from Oxford University. In 1935, she created the Annie J. Cannon Prize for "the woman of any country, whose contributions to the science of astronomy are the most distinguished." She became the William C. Bond Astronomer at Harvard University in 1938. Annie Jump Cannon's career in astronomy lasted for more than 40 years, until her retirement in 1940. Despite her retirement, she continued to actively work on astronomy in the observatory up until a few weeks before she died. During her career, Cannon helped women gain acceptance and respect within the scientific community. Her calm and hardworking attitude and demeanor helped her gain respect throughout her lifetime and paved the path for future women astronomers. Cannon died on April 13, 1941, in Cambridge, Massachusetts, at the age of 77. She died in the hospital after being ill for over a month. The American Astronomical Society presents the Annie Jump Cannon Award annually to female astronomers for distinguished work in astronomy. 1929, chosen as one of the "greatest living American women" by the League of Women Voters. The lunar crater Cannon is named after her. The Annie J. Cannon Award in Astronomy named in her honor; awarded since 1934 (now annually) to a woman astronomer in North America. Cannon Hall, a residence dormitory at the University of Delaware, named in her honor. Named Curator of Astronomical Photographs at Harvard. Member of the Royal Astronomical Society in Europe. A Google Doodle honoring her and her work appeared in 2014. ——; Pickering, Edward Charles (1918). Henry Draper Catalogue. Annals of the Astronomical Observatory of Harvard College. Cambridge, Massachusetts: Astronomical Observatory of Harvard College. LCCN 18018382. OCLC 809461762. Available in an "updated, corrected, and extended machine-readable version" at "Henry Draper Catalogue and Extension (Cannon+ 1918–1924; ADC 1989)". VizieR archives. Strasbourg, France: Centre de données astronomiques de Strasbourg [Strasbourg Astronomical Data Center]. Retrieved 2015-01-08. Cannon, Annie J.; Pickering, Edward C. (1918). "The Henry Draper catalogue 0h, 1h, 2h, and 3h". Annals of Harvard College Observatory. 91: 1. Bibcode:1918AnHar..91....1C. Cannon, Annie Jump; Pickering, Edward Charles (1918). "The Henry Draper catalogue : 4h, 5h and 6h". Annals of Harvard College Observatory. 92: 1. Bibcode:1918AnHar..92....1C. Cannon, Annie Jump; Pickering, Edward Charles (1918). "The Henry Draper catalogue : 7h and 8h". Annals of Harvard College Observatory. 93: 1. Bibcode:1919AnHar..93....1C. Cannon, Annie Jump; Pickering, Edward Charles (1918). "The Henry Draper catalogue : 9h, 10h, and 11h". Annals of Harvard College Observatory. 94: 1. Bibcode:1919AnHar..94....1C. Cannon, Annie Jump; Pickering, Edward Charles (1918). "The Henry Draper catalogue : 12h, 13h, and 14h". Annals of Harvard College Observatory. 95: 1. Bibcode:1920AnHar..95....1C. Cannon, Annie Jump; Pickering, Edward Charles (1918). "The Henry Draper catalogue : 15h and 16h". Annals of Harvard College Observatory. 96: 1. Bibcode:1921AnHar..96....1C. Cannon, Annie Jump; Pickering, Edward Charles (1918). "The Henry Draper catalogue : 17h and 18h". Annals of Harvard College Observatory. 97: 1. Bibcode:1922AnHar..97....1C. Cannon, Annie Jump; Pickering, Edward Charles (1918). "The Henry Draper catalogue : 19h and 20h". Annals of Harvard College Observatory. 98: 1. Bibcode:1923AnHar..98....1C. —— (1923). "The spectrum of Nova Aquilae". Annals of the Astronomical Observatory of Harvard College. v. 81 (3). OCLC 786374390. —— (1916). "Spectra having bright lines". Annals of the Astronomical Observatory of Harvard College. v. 76 (3). OCLC 786374401. —— (1912). "Comparison of objective prism and slit spectrograms". Annals of the Astronomical Observatory of Harvard College. v. 56 (8): 251. Bibcode:1912AnHar..56..251C. OCLC 786374385. —— (1912). "The spectra of 745 double stars". Annals of the Astronomical Observatory of Harvard College. v. 56 (7): 227. Bibcode:1912AnHar..56..227C. OCLC 786374368. —— (1912). "Classification of 1,688 southern stars by means of their spectra". Annals of the Astronomical Observatory of Harvard College. v. 56 (5): 115. Bibcode:1912AnHar..56..115C. OCLC 786363259. —— (1912). "Classification of 1,477 stars by means of their photographic spectra". Annals of the Astronomical Observatory of Harvard College. v. 56 (4): 65. Bibcode:1912AnHar..56...65C. OCLC 786374355. ——; Pickering, Edward Charles (1909). "Maxima and minima of variable stars of long period". Annals of the Astronomical Observatory of Harvard College. v. 55 (pt. 2): 95. Bibcode:1909AnHar..55...95C. OCLC 786370272. ——; Pickering, Edward Charles (1907). "Second catalogue of variable stars". Annals of the Astronomical Observatory of Harvard College. v. 55 (pt. 1). OCLC 603459862. —— (1903). "A provisional catalogue of variable stars". Annals of the Astronomical Observatory of Harvard College. v. 48 (3): 91. Bibcode:1903AnHar..48...91P. OCLC 786370792. ——; Pickering, Edward Charles (1901). "Spectra of bright southern stars photographed with the 13-inch Boyden telescope as a part of the Henry Draper Memorial". Annals of the Astronomical Observatory of Harvard College. v. 28 (pt. 2): 129. Bibcode:1901AnHar..28..129C. OCLC 786363059. ^ Reynolds 2004, p. 18. ^ a b c "Brooklyn Museum: Annie Jump Cannon". Brooklyn Museum. Retrieved 2017-04-13. ^ Mack 1990, p. 91. ^ Des Jardins 2010, p. 89. ^ "History of Women in Astronomy: Annie Cannon". Astronomical Society of the Pacific. University of California at Berkeley. Retrieved 2017-04-13. ^ "Girl Star-Gazer Now Specialist". Statesville Record and Landmark. 19 November 1928. Retrieved 13 April 2017 – via Newspapers.com. ^ a b c d e "Annie Cannon". She is an Astronomer. 2014. Retrieved February 18, 2014. ^ a b Des Jardins 2010, p. 102. ^ a b c d Mack 1990, p. 99. ^ Hennessey, Logan (23 Jul 2006). "Annie Jump Cannon (1863–1941) – Early life". Wellesley College. Retrieved 1 April 2014. ^ "Annie Jump Cannon (1863–1941), sitting at desk". Smithsonian Institution Archives. Smithsonian Institution. Retrieved 11 July 2013. ^ a b Shteynberg, Catherine. "Pickering's Women". Smithsonian Institution Archives. Smithsonian Institution. Retrieved 8 May 2009. ^ a b c d e f "Annie Jump Cannon | American astronomer". Encyclopædia Britannica. Retrieved 2016-09-10. ^ "Annie Jump Cannon". ancestry.com. March 9, 2009. Retrieved November 16, 2016. ^ a b c d e Fitzgerald, Helen (18 September 1927). "Counted the Stars in the Heavens". The Brooklyn Daily Eagle. Retrieved 13 April 2017 – via Newspapers.com. ^ "Astronomers Find New Class of Starlike Objects". Del Rio News Herald. 10 June 1998. Retrieved 13 April 2017 – via Newspapers.com. ^ "Honor Woman of Delaware Birth". The Morning News. 18 March 1914. Retrieved 13 April 2017 – via Newspapers.com. ^ "In acknowledgement of her work..." The Marion Star. 25 June 1921. Retrieved 13 April 2017 – via Newspapers.com. ^ Des Jardins 2010, p. 95. ^ Heward, Anita. "Annie Cannon". Retrieved 10 June 2016. ^ a b c "Annie Jump Cannon.". Encyclopedia of World Biography. Encyclopedia.com. 2004. Retrieved 1 April 2014. ^ "Woman Astronomer Discovers a Star". The Inter Ocean. 9 July 1905. Retrieved 13 April 2017 – via Newspapers.com. ^ a b "Woman Making Index of 100,000 Stars for a Catalogue". The Danville Morning News. 10 February 1913. Retrieved 13 April 2017 – via Newspapers.com. ^ "Gal Astronomer". Rushville Republican. 18 April 1968. Retrieved 13 April 2017 – via Newspapers.com. ^ "Woman's Prize". The Brooklyn Daily Eagle. 5 February 1935. Retrieved 13 April 2017 – via Newspapers.com. ^ Greenstein, George (1993). "The ladies of Observatory Hill". The American Scholar. 62 (3): 437–446. JSTOR 41212156. ^ Waterfield, R. L. (14 June 1941). "Dr. Annie J. Cannon". Nature. 147 (3737): 738. Bibcode:1941Natur.147..738W. doi:10.1038/147738a0. ^ "Noted Woman of Science Dies". Daily Capital Journal. 14 April 1941. Retrieved 13 April 2017 – via Newspapers.com. ^ "Annie J. Cannon is Dead; Famed as Astronomer". Chicago Tribune. 14 April 1941. Retrieved 13 April 2017. ^ "Annie Jump Cannon Award in Astronomy | American Astronomical Society". aas.org. Retrieved 2016-09-10. ^ "Cannon, Annie Jump, 1863–1941. Papers of Annie Jump Cannon : an inventory". Harvard University Archives. Harvard University Library. 2014. Retrieved 13 April 2017. ^ Jaarboek der Rijksuniversiteit te Groningen. 1920-1921. Promotiën Faculteit der Wis- en Natuurkunde. Honoris Causa 31.5. '21, p. 79. ^ "Noted Woman Astronomer, Classifier of More Stars than Any Other, Dies at Home in Cambridge in 77th Year". The Eagle. 14 April 1941. Retrieved 13 April 2017 – via Newspapers.com. ^ a b c Smith, Lindsay (2017). "Annie Jump Cannon". Project Continua. Retrieved 2016-03-31. ^ Welther 1978, p. 86. ^ a b c "Cannon, Annie Jump, 1863–1941. Papers of Annie Jump Cannon : an inventory". Harvard University. 2014. Retrieved 13 April 2017. ^ Welther 1978, p. 87. ^ a b Schwartz, Anita Z. (12 December 2014). "Google Doodle honors Delaware native Annie Jump Cannon". University of Delaware. Retrieved 2017-04-13. ^ "Wesley Unveils Annie Jump Cannon Historical Marker". wesley.edu. Retrieved 2016-12-04. ^ Leof, Madelin (13 May 1932). "Famed Astronomer Catalogues Stars". The San Bernardino County Sun. Retrieved 13 April 2017 – via Newspapers.com. Des Jardins, Julie (2010). The Madame Curie Complex—The Hidden History of Women in Science. New York, NY, US: Feminist Press. ISBN 9781558616554. OCLC 618891417. Reynolds, Moira Davison (2004). American Women Scientists: 23 Inspiring Biographies, 1900–2000. Jefferson, NC, US: McFarland. ISBN 9780786421619. OCLC 60686608. Welther, Barbara L. (October 1978). "Highlights of an Exhibit to Honor Annie Jump Cannon". The Journal of the American Association of Variable Star Observers. 7 (2): 85–87. Bibcode:1978JAVSO...7...85W. Lang, Harry (1994). Silence of the Spheres. Westport, CT: Bergin & Garvey. Greenstein, George (Summer 1993). "The ladies of Observatory Hill". American Scholar. 62 (3): 437–446. ISSN 0003-0937. JSTOR 41212156. (Registration required (help)). Veglahn, Nancy J. (1991). Women Scientists. Facts On File. ISBN 978-0816024827. OCLC 22957220. Project Continua: Biography of Annie Jump Cannon Project Continua is a web-based multimedia resource dedicated to the creation and preservation of women's intellectual history from the earliest surviving evidence into the 21st Century. Papers of Annie Jump Cannon, 1863–1978 at Harvard University. ^ Gerber, Carole (2011). Annie Jump Cannon, Astronomer. Gretna, LA: Pelican.